Born in Temagami, Ontario, Benjamin Chee Chee largely taught himself to draw and paint. His father died when he was two months old and he lost track of his mother. One reason behind his drive for success as a painter was his ambition to be reunited with her. 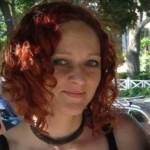 Originally from Bratislava, Slovakia, Brona’s unique experience in the arts dates from before age 15, although only recently she began to produce paintings. Since 2013 she has created an extensive array of paintings and drawings, including painting large-scale collaborative murals. Through my art, I want to tell the stories of my Anishnaabe people. Sometimes I want to tell my story, specifically, as an Ojibway woman navigating 2 worlds, striving to hold strong to my traditional beliefs within the constructs of dominant society. Christi Belcourt was born in Scarborough, Ontario in September, 1966. She is the first of three children born to Anthony (Tony) Belcourt and Judith Pierce Martin. 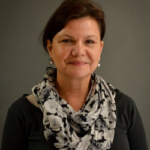 Her Metis ancestry originates from the historic Metis community of Lac Ste. Anne, Alberta. Every occasion I get to show my work allows me to break my people’s isolation, to promote our traditions and build a bridge between cultures. The situation of youth truly concerns me, so I am always very happy to share with them my experience, and tell them how much art helped me free myself and gain access to a healthy life style full of discoveries. 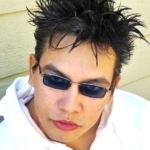 Garnet Tobacco is a Cree artist, originally from Manitoba. He was heavily influenced by his artist mentor, Isaac Bignell. Garnet’s work does appear in galleries but he also sells from the street, which is how he became a part of Indian Art From The Edge. The natural inclination has led me into a career as physical therapist and artist. I have been inspired and influenced by myths, legends and history, finding common thread in a straggle to maintain distinct identity. In those stories and symbols I have found a profound healing and transformative powers that drive my creative work. 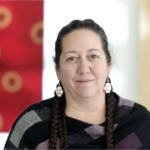 Jackie Traverse is widely known in art communities across Canada. Her paintings, drawings, documentaries, and sculptures speak to realities of being an Aboriginal woman. 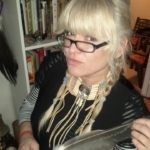 She has created stop-motion animation on missing and murdered women in Canada, another on the sixties scoop titled “Two Scoops” and “Empty” a tribute to her estranged mother. 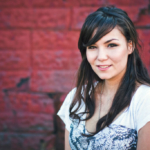 Jackie is deeply moved by the injustices faced by First Nations people. 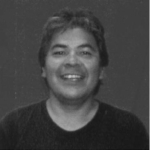 Odawa Nation, born and raised on Manitoulin Island, James is a self-taught artist and has been painting since 1977. 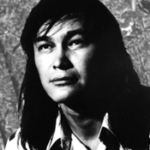 Influences include his cultural background and artists such as Enoch Jacko, Randy Trudeau, James Simon-Mishibinijima, parents Alex and Blanche Jacko, Mary and Robert Pheasant and the Elders of Wikwemikong. 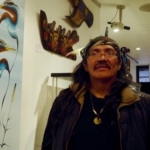 One of Canada’s foremost artists, Mishibinijima created a unique body of art work over the past decades and established a loyal following in North America and Overseas. The themes depicted in his paintings have universal appeal and speak to all who yearn for spiritual sustenance. 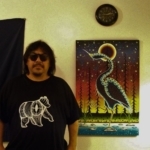 Mishibinijima is creator of the highly collectible and sought after Mishmountains painting series. Jasyn’s paintings are done with a combination of both airbrush and hand-painted applications. He encourages the use of both traditional and contemporary practices in his paintings. He also applies this to everyday living as well, preserving tradition while exploring technologies and new ideas. Norval Morrisseau gave Jim his blessing that he could paint in this style and tradition. 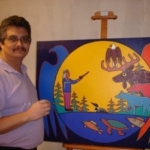 Jim has been painting on a fulltime basis in the Ojibwe Woodland style since 2005. Jim is a born medicine man and artist along with being a traditional drum keeper, eagle staff carrier as well as pipe carrier as these sacred items were given to him by the creator. 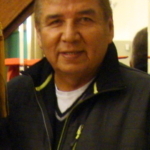 Born in 1954, John Laford is an Ojibway artist from Manitoulin Island, Ontario. 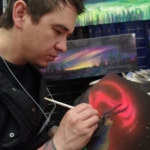 He has thoroughly studied his culture and art at Algonquin College in Pembroke, Ontario. He also studied pottery in New Mexico and the old pictographs and rock paintings of his ancestors. 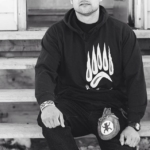 Chipewyan Dene artist John Rombough is nationally recognized for his works. His painting style reflects the harmony of the Dene people, their way of life and the natural world. His distinctive modern aboriginal designs encompass his personal visions and strong connections with his rediscovered roots. 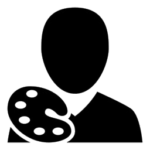 I have the heart of a storyteller and will use various forms of artistic expression to share stories. For me, art is a spiritual expression and my paintings are influenced by traditional cultural teachings such as the medicine wheel and the sacred circle of life. I find that balance and harmony along with the four sacred elements of life (earth, air, fire, and water) are foundational aspects of my work. Leland Bell’s wonderful paintings frequently use stylized human figures sharing the affinity of family or friends, often depicting imagery of nurturing, sharing, learning, peace and serenity. 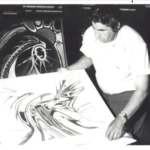 He was influenced in his youth through teachings, ceremonies, and art instruction at Cultural Arts Camps on Manitoulin Island, and it was there that his distinctive style first emerged. Leland has been painting professionally since 1976 and in addition to his painting devotes much of his creative energy to writing and music. Loretta was a quilter for about 10 years after she seen a quilt in a mall. she loved it so much but couldn’t afford it. So she decided to try a shot at making a quilt. and she began to make art quilts in 2010. 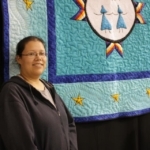 This is how she was making a living is through her Art quilts. She still makes quilts but its mostly just paintings now. 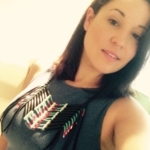 Nikki is a descendant of Ojibway, Odawa, Pottowatomi descent. A majority of the works to date have been acrylic on canvass and watercolour paper. More recently, she has been experimenting with oils. The theme of many of the works is generally reflective of relationships, family and teachings as inspired by people in surrounding communities and in her home community of Wikwemikong. 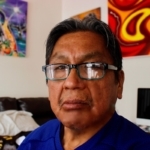 Riel Benn is an award winning artist from the Birdtail Sioux First Nation located in Southwestern Manitoba. His most famous works are “The Magazine Series” and his ongoing series entitled “The Best Man” which was shown in Brandon, Manitoba in 2004, and Saskatoon, Saskatchewan in 2006. He has also participated in a group project with eight other artists from Manitoba, in which the artists created sculptors and paintings. Sharifah is an Anishnabe artist from the Mississaugas of Scugog Island First Nation. Since early childhood, Sharifah has been directed toward a life of art and culture. 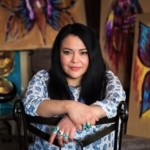 Sharifah draws from her Ojibway roots and knowledge of Woodlands art to create unique works that include everything from acrylic paintings to beadwork to engraving. 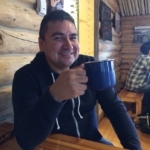 Shaun Hedican is a member of the Loon Clan and The Eabametoong First Nation. (Located 300 kilometers northeast of Thunder Bay). Shaun’s style of painting developed from his experiences and knowledge of pictographs, birch bark scrolls, beadwork, and other traditional iconography.